Several simple triangular baked goods lay on the plate in the kitchen. They will not be there long, not in this house. 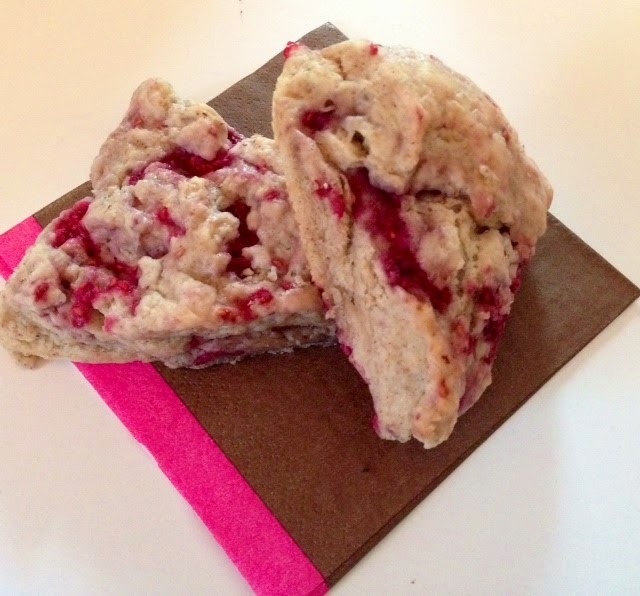 This version is raspberry, the fourth variation in roughly of month of scone-baking, and is by far the best version yet. But I say that about each new variety baked. Next week, those words may very well be spoken about a 'newer' new version. We will just have to see. I have always liked to bake, beginning with my Aunt Bertie's recipe for chocolate chip oatmeal cookies, which I learned at the green age of 12. I remember an argument with my mother when I was about 14 over the making of these cookies, and whether or not the baking sheet had to be greased. I said it did not. She insisted it did. I proved her wrong with the first batch. No greased sheet necessary. At 14, I was already a pro at that recipe. She never questioned it again. In the last 15 or so years, I just do not take the time to bake for myself. I bake for others, work events usually, and I do enjoy it, but baking something for me at the house? Uh-uh. Not worth the effort. And then there were scones. A friend of mine shared a recipe for Irish Scones about a month ago, and since St. Patrick's Day was imminent, I gave it a try. I had never made scones before, and the recipe sounded easy, not too time consuming. Why not? A few minutes of mixing, a knead or two of dough (well, just a few more), and 20 minutes in the oven. Yeah, I can do that. I peeked into the oven after a few moments and saw the pastry triangles plump up into utter loveliness. And the smell? Like the best bakery you have known. The first batch I made was according to the recipe, including traditional Irish flavorings of caraway and raisins. Leave it to the Irish to take a handful of simple ingredients and create a meal worthy of prose. I sat with my latte and a warm scone, with eyes closed in an effort to taste more fully, and imagined other flavors I could bake. The base recipe lent itself to easy modification, and my creative juices were well-fueled with scones at the moment. A few days later, it was apple cinnamon scones for a work pot luck. A week later, cinnamon raisin scones emerged from the oven for breakfast, followed a few days later by a second batch of the same variety. Then last night came the venture into berry flavors -- raspberry, to be exact. The newest version outdid all previous versions. That is, of course, until I make one of the early versions again and become reintroduced to its goodness. Who am I kidding? They're all good. The recipe is simple, involving ingredients I readily have on hand and not involving long shopping lists with mad dashes to the market. Everything I need is already here. With the right measurements, a few simple items can be transformed into something heartwarming in less than an hour, start to finish. Everything in life should be this simple. Shouldn't it be? Life, I mean. It often isn't. Sometimes, we make it harder than it has to be. We listen to the voices in our heads which tell us we need to be more of this or less of that. We listen to society which has its own ideas on how we should be. We see advertisements that tell us we can be popular and beautiful if we just spend more money on this or more time with that. We listen to all the messages except the one closest to us -- the one in our heart, speaking quietly from behind the crowd, waving a hand, saying "What about this? You really love this." Sometimes that is the voice that is hardest to hear, the one that has our best interest at heart because it comes from our heart. The simplicity of scones reminded me of the perfection in life's simplicities. I can throw scones together in a flash now, having committed the recipe to heart. A friend now calls me the Queen of Scones. I smile, but not for the reason she thinks. I smile because scones helped me figure it out. Scones illustrated the life I wanted. Simple. Unpretentious. Easily made from what is already near. And when opened, wafting a goodness that enlivens the spirit and warms the heart. Yeah, I want to be like a scone. You didn't think I'd leave you without the recipe, did you? I have modified the first recipe for my own tastes, adding ground flax seed to give me the illusion of being more healthful and including a bit of vanilla because, well, I like vanilla. Heat oven to 350 degrees Fahrenheit. Mix dry ingredients together. Slice butter and cut into dry mixture with fork or with pastry cutter until it is like course meal. In separate bowl, mix vanilla, milk, and yogurt. Add wet mixture to dry mixture and blend as well as you can with a fork. Continue to mix dough with hands, kneading it until it holds together. Divide dough in half. Place half of dough on floured board and press into a circle about one-inch thick. With a knife, cut circle into six triangles (cut like you would a pizza). Repeat with other half of dough. Place scones onto greased baking sheet. Brush tops with egg. Dust with sugar, if desired. Bake for 20 minutes (my oven takes 25) until scones are lightly browned. Best when served warmed. Store leftovers in Zip-lock bag or tightly-covered dish so they do not dry out. Heat butter in pan over medium heat. Add apples and cinnamon. Saute until apples are tender. I used frozen, and I must say, it made the dough very wet and messy when kneading. I would suggest adding berries at the very very end of the kneading process to save you this frustration.